The Missouri River rises in the Rocky Mountains of western Montana, and flows generally to the southeast for 3,767 kilometers (2,341 miles) to its confluence with the Mississippi River north of St. Louis, Missouri. It is the longest river in North America. The river does not follow a straight southeasterly course along this distance, but includes many meander bends such as the one in this astronaut photograph from the International Space Station. This particular bend is occupied by Lake Sharpe, an approximately 130 kilometer (80 mile) long reservoir formed behind the Big Bend Dam on the Missouri River near Lower Brule, South Dakota. 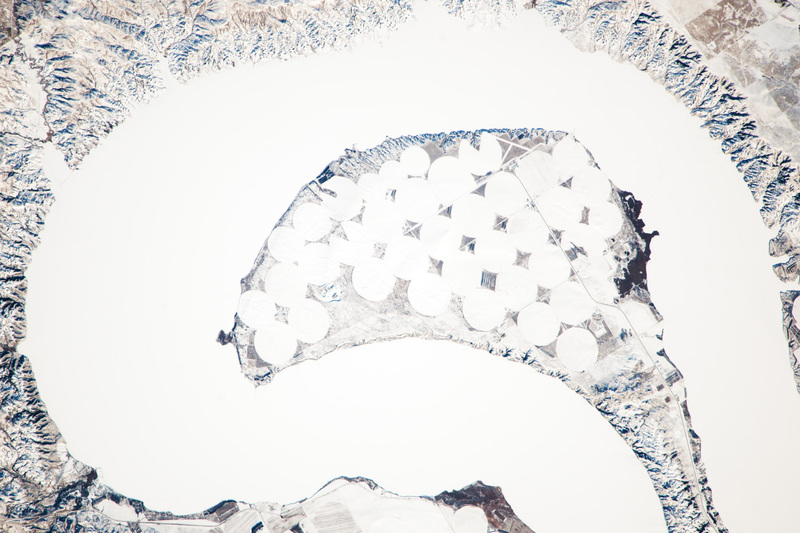 The lake surface is frozen and covered with snow, presenting a uniform white appearance. As meander bends develop, they tend to assume a distinctive U shape. 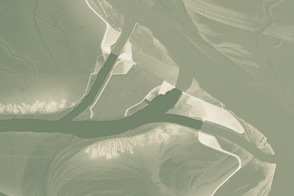 Over time, the river channel can continue to cut into the ends of the “U,” eventually bringing them so close together that the river then cuts across the gap to achieve a shorter flow path and cut off the meander bend. When this happens and the meander ceases to be part of the active river channel, it may become an oxbow lake. 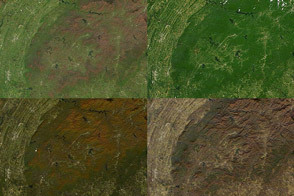 The distance across the narrow neck of land (image lower right) associated with this meander is approximately 1 kilometer (0.62 miles). However, the river flow is controlled by the Big Bend Dam downstream, so the natural process of meander cutoff has been significantly slowed. Snow cover also highlights circular agricultural fields on the small peninsula within the meander bend. This type of field indicates center-pivot irrigation, where water is distributed from a central point radially outwards using sprinklers to cover the field area. 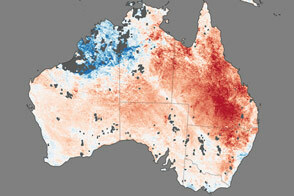 Crops grown here include corn and soybeans, according to data from the U.S. Department of Agriculture’s CropScape database. Astronaut photograph ISS038-E-23651 was acquired on December 26, 2013, with a Nikon D3X digital camera using a 1000 millimeter lens, and is provided by the ISS Crew Earth Observations experiment and Image Science & Analysis Laboratory, Johnson Space Center. The image was taken by the Expedition 38 crew. It has been cropped and enhanced to improve contrast, and lens artifacts have been removed. The International Space Station Program supports the laboratory as part of the ISS National Lab to help astronauts take pictures of Earth that will be of the greatest value to scientists and the public, and to make those images freely available on the Internet. Additional images taken by astronauts and cosmonauts can be viewed at the NASA/JSC Gateway to Astronaut Photography of Earth. Caption by William L. Stefanov, Jacobs at NASA-JSC. 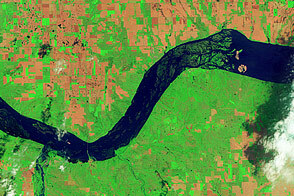 The meandering Missouri River doubled back on itself and formed this U-shaped lake.